There was a brief moment of sunshine yesterday. I shook the dust of my gardening gloves and raced outside. I was thrilled to see my bulbs are coming up. I happily weeded around the fence line. The cheer lasted until the right side of the yard. I had planted daffodils along the fence. They came up. There was evidence of a blossom. It had been ravaged by a slug. The shoots were stripped as well. I was greatly annoyed. The slug had wisely moved on. If it hadn’t I’m sure that we would now be short of salt in the kitchen. I noticed that my neighbors daffodils were blooming nicely. My crankiness took root and settled in. Driving to church this morning I noticed that the entire neighborhood was in bloom. Our slug had amazing power because not only had it eaten my blossom but it also had stolen the cheer from what I normally rejoice over. By the time I got to church I was sitting right on the edge of angry again. I have a friend who says that a swift kick to the head is sometimes the best thing for us. This bible verse in the sermon delivered. Minor irritation has a tendency to grow when it isn’t dealt with. Little things feed it. And then, sadly, it spreads. Sometimes a foul mood can take permanent residence. It can start to choke out the love and grace and joy from your life. Bitterness can come from completely legitimate injuries. But when it grows, it still robs us of joy. If allowed, it can hurt others too. After church I decided to do some more weeding. This time in my heart. The best way for me to kick a bad mood is to go for a run and crank up some praise music. Somewhere in the third mile I was grinning. The entire trail was covered in bright yellow blossoms. I love daffodils. Yellow, orange, white and green. Spring is definitely here. Is it time to weed? Go run your race. 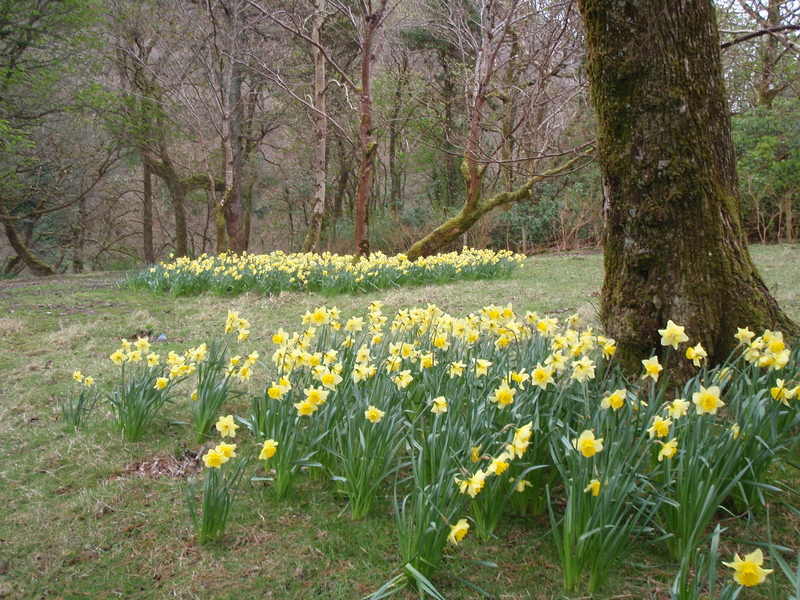 There are daffodils everywhere. Gifts are a tricky thing. I think I hurt my daughter’s feelings the other day. We were at a city park and she came running up to give me a daffodil. I did the responsible parent thing and made her put it down. I explained all about how flowers in parks have to stay put so everyone can enjoy them. She really shouldn’t pick flowers in the park. I’m sure she won’t do it again. Looking back, I wished I’d smiled and smelled the flower. I know we don’t fail as parents over one single event and that next time I’ll do better. I just hope this time isn’t the lesson that sticks with her as she grows. I hope it doesn’t squelsh the part of her that wants to give good gifts to people she loves. I found this quotation in a book my mom gave me. Mister Rogers was a very wise man. I’m going to schedule some time into my week to sit with my daughter and watch some Mister Rogers. My favorite episode is the one where he takes his television friends on a tour of the crayon factory. I love Mister Rogers. I love crayons. I love my child. I love to give good gifts. I trust she’ll learn this too.